C#, .Net Framework: July 2006 . I have removed my feed from squeet. I was getting a lot of problems where by it would send me about 5 or 6 updates to my old posts a day. 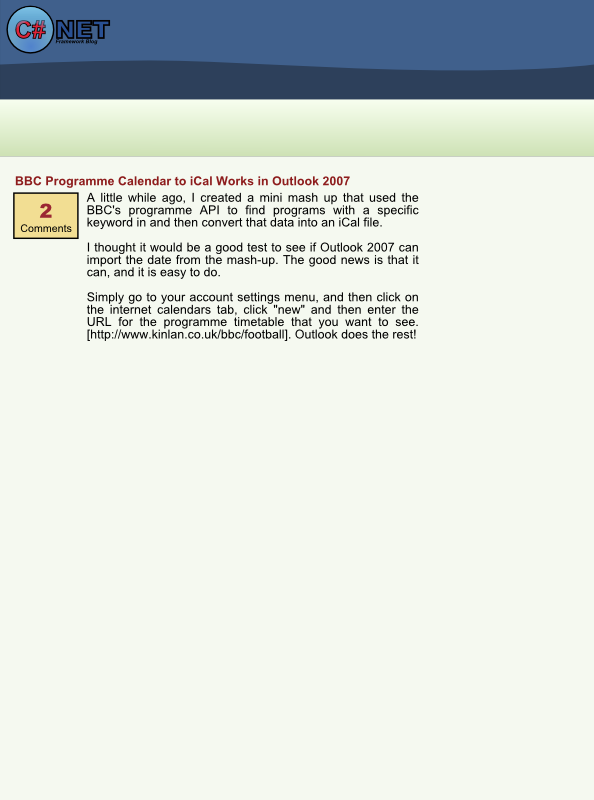 Not many people were subscribing to it, so I have removed it from my site to stop any more problems. 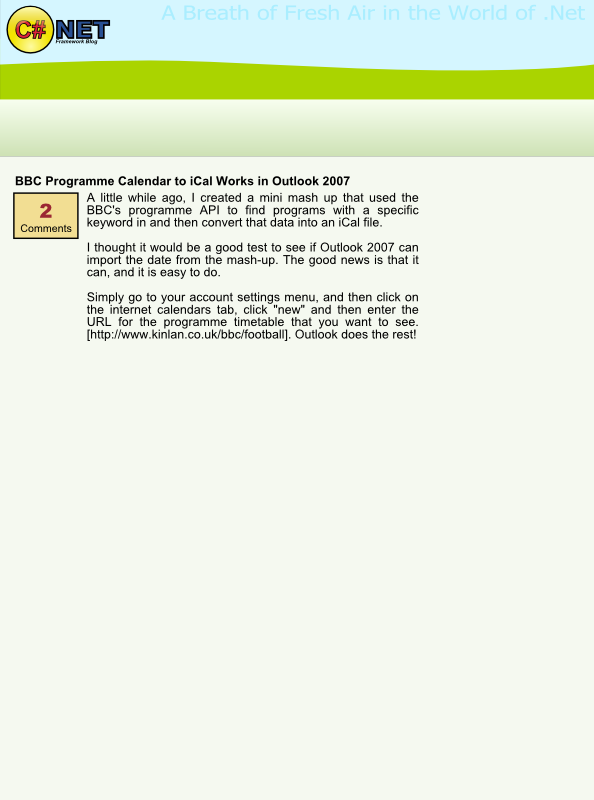 A colleague of mine, Phil Calver, has set up a site www.whatsatthetop.com using ASP.Net 2.0 and Web parts. It is a Top 10 Retail Mashup, taking data from sites like Amazon and CNet and Booksense. iforgive.eu is going to be a C#, ASP.Net 2.0 sample hosting site. This blog, www.kinlan.co.uk will details the trials and tribulations of the work that is going into making the site. It will be a step-by-step guide into how to make a site using ASP.Net 2.0. The first thing that I will do is come up with a simple story about what I want from the site, then hopefully decide how I am going to design the site. I will attempt to use a TDD approach to designing and developing a site. A little while ago I launched Topicala.com. Topicala basically was an extension of my tag directory but it was not specific to my site. I have been thinking over the last couple of weeks (whilst I have been unable to keep topicala up to date) that I might as well make it distributable, i.e that anyone could run the software. So that is what I am going to do. I will release the code shortly, once I have re-deployed it under the kinaln.co.uk domain. And I will make it maintainable and modfiable so that any person can have something similar to www.topicala.com underneath their own site. A little while ago, I embarked on two side projects, one called www.Topicala.com, Topicala at the time was quite a sucessful test project that gets a fair few users. The second was called iforgive.eu and iforgiv.eu. I bought the .eu domains when they came out because I thought that I had a good marketing change with "I forgive u", since other .us domains had become popular ala del.icio.us. I had several ideas for this domain and I will list them now, each of which would never work out. I have just updated the template to one of my own design. I am just playing about and getting it to work in IE. Following on from my previous post: I am still not happy with the style of this site . I have come up with two examples of what I might come up with in a final design. It is supposed to look like a sunny day. Let me know what you think of either of them. I go through fazes, I really like the look of my site, then it hits me.... Really, the style of my site is rubbish. I am going to have to change it again, the only problem is that I don't really get much time at all. Anyway, at least I have come up with a potential logo for the site, (when the new design kicks in). I thought I would mess around with some vector graphic programs and see what I can come up with. UPDATE: If you are reading this entry now, I am a lot happier with the site.